This section discussed the fascinating history of the kite, and its incredible contributions to science, war and having fun. The kite is believed to have been first invented in China around 2,800 years ago in Weifang, China. This city is still a great center of kite activity, and hosts a huge kite festival each year. It is also the site of the largest kite museum in the world. The first kites used paper stretched over a frame of light weight sticks or bamboo, and long string to control and tether the kite. As time went on the Chinese also learned to build more complex kites, shaped like dragons and other mythological creatures. From China, the art of kite-making spread to Japan, India and eventually the rest of the world. 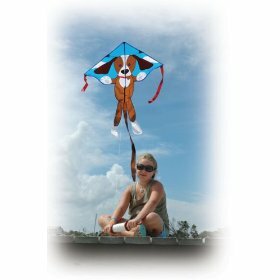 Kites can range from a simple triangular design to very complex forms shaped like birds, dragons and various flying creatures. However the basic principal is the same: the flat surface of the kite functions as a wing, and the wind causes the wing to lift up, while the string or wire held by the operator on the ground controls the height of the kite and also serves as a tether and counter to the upward lift of the wind acting on the kite. Kites can vary widely in size from the tiny to the enormous. It is said that Malaysian fishermen used to make kites out of leaves to carry their fishing lines out to sea, while today light weight materials have allowed the construction of very large kites. The largest kite ever flown had a wingspan of 5,952 Square feet! While kites today are used primarily in recreation, they have also had very important uses in the areas of science and warfare and technical endeavors. The first recorded use of the kite for military purposes was in ancient China, when a Chinese General is said to have used a kite to carry a flaming ball into the sky in an effort to convince his superstitious troops to fight. The troops were refusing to fight because they had seen a meteor fireball fall to the sky and they considered it a bad omen. The enterprising general used a kite to "return" the fireball to the sky and the troops were convinced that the omen had been reversed. In the 1500s, a Japanese Admiral used different colored kites flown from his ships to communicate commands to the ships of his fleet during a Japanese invasion of Korea. In the days before invention of the semaphore or radio, this kite message system was extremely innovative, but unfortunately for the Japanese it did not decide the war, and they were defeated. In the West, kites were first used for practical purposes in the late 1700s. In 1752 Benjamin Franklin conducted his famous experiment in which he used a kite to attract lightning, and then received a jolt of electricity which traveled down the string. The experiment proved that lightning was electrical in nature, and represented an important advance in the study of the weather and the fledgling science of electricity. In the years prior to the invention of the airplane, kites offered a way for humans to fly. Large kites were used to lift people and materials. In 1899, the future inventors of the airplane, used kites to study and test wing designs. The lessons that they learned would help the, invent the airplane 4 years later. In the meantime, kites were used to lift people and objects. In 1901, Marconi used a kite to lift a radio antenna high into the sky, thus allowing him to conduct the first experimental wireless transmission of radio signals from England to North America. In 1906, George Lawrence used a kite to fly a camera above the ruins of San Francisco and take pictures of the damage after the great 1906 earthquake. This was one of the first examples of Kite Arial Photography (KAP). The French army used kites as late as the start of World War 1 to lift men into the air to act as observers. Their altitude allowed them to spot enemy positions. Kite flying observers become largely obsolete once the airplane came into common use, but kites continued to be used even during World War 2. The Germans used kites to lift men into the air and tow them behind a surfaced U-boat to help spot enemy shipping and destroyers. Allied airmen were issued a kite nicknamed a Gibson-Girl which they were to fly from their lifeboat in the event that they ditched at sea. The kite made it easier for rescuers to spot them. During World War 2, kites were also used as target drones for antiaircraft gunnery practice. Today, kites are used primarily for entertainment and sporting purposes, but they continue to have practical uses. A company has developed a large sail-kite which can be attached to a cargo ship to harness the wind and tow the boat behind it. The device is highly sophisticated and is controlled by complex electronics. This sail kite promises to reduce costs and pollution emissions as ships use less fuel. With the advent of modern strong lightweight materials, kites have made a comeback as a method of allowing humans to fly. Kites are now used to tow buggies, surf, and fly. Whatever their use, kites have shown a remarkable staying power. There are few inventions made over 2,400 years ago that are still in common use. The kite represents a link to our past as well as promise of harnessing the power of the wind.